The new ZenBook 14 has a mind-boggling 92 percent screen-to-body ratio to best even the XPS 13. How did Asus manage to achieve such narrow bezels on all four sides of the display while still offering 100 percent sRGB and Whiskey Lake-U? The ZenBook 14 is a really good laptop. It has the looks and the performance in equal measures. It’s easy to live with on a daily basis -- the display is good, the audio is decent, the typing experience is satisfying for an ultrabook with the unique ErgoLift hinge. The compact form is extremely portable and, with a Core i7 processor, it can hang on even when the user demands some performance. 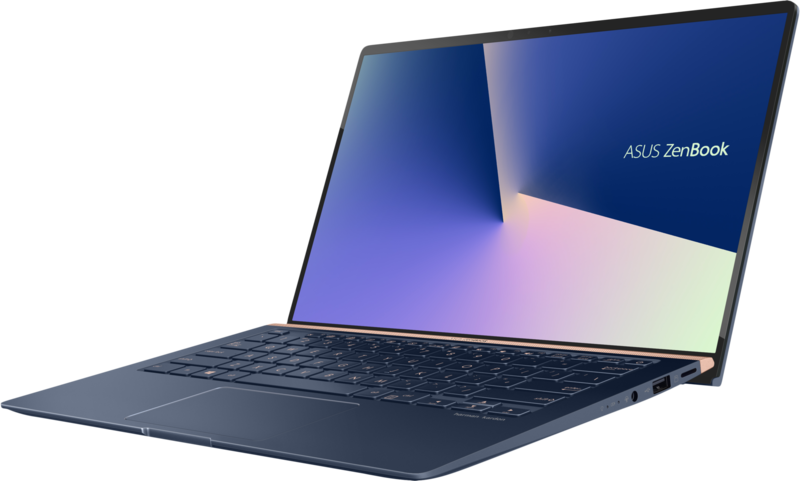 With similar specs to the Dell XPS 13 and the MacBook Air, the ZenBook 14 looks to be a good performer from Asus that takes some of the best bits from the ZenBook S and ZenBook Pro models from 2018. The ZenBook 14 is one of the better ultraportables you can buy, but it's not quite the best.The main attraction is the laptop's compact chassis, which fits a 14-inch display in what is essentially the footprint of a traditional 13-inch laptop. And with a gorgeous military-tested dark-blue aluminum finish, the ZenBook 14 combines that convenience with durability and beauty. Positive: Compact size; light weight; high mobility; nice gaming performance. Positive: Powerful processor; slim size; light weight; silent system; very long battery life; attractive price. Positive: Metal case; face ID unlock; long battery life; slim size. Negative: Relatively heavy and bulky. Model: The Asus ZenBook 14 UX433FA is a laptop that claims to be the world’s smallest 14-inch laptops to date. It is designed to give the freedom to discover creative power, including its breathtaking frameless NanoEdge display. Users will appreciate not only the tremendous power within and the thoughtful attention to detail, but also the timeless beauty of the design, with its sensational Royal Blue or Icicle Silver finish enhanced by the new Rose Gold trim panel. ZenBook 14 heralds a new era of ultraportable design, with an ultracompact, ultralight chassis. Featuring the 4-sided NanoEdge display, the ZenBook 14 is one of the world’s smallest 14-inch laptops and is 13 % smaller than the previous generation ZenBook 14. On the keyboard, the ZenBook 14 goes the extra mile with its exclusive ErgoLift hinge, an engineering masterpiece designed to automatically tilt the keyboard to the most comfortable typing position. The ZenBook 14 also introduces the exclusive new NumberPad, a touchpad with a switchable numeric keypad for speedy data entry. Even when the NumberPad is activated, the touchpad retains its cursor function. As for the display, the ultraslim bezels are just 2.9 mm thin at the sides, 3.3 mm at the bottom and a mere 6.1 mm at the top to accommodate the camera. The ZenBook 14 is only about the size of an A4 sheet, which is smaller than many 13.3-inch laptops. Its crisp, clear, high-resolution display makes any visuals look their best, with wide viewing angles and vivid, accurate colors. It also features exclusive ASUS technologies, including ASUS Splendid and ASUS Tru2Life Video that fine-tune display parameters to ensure optimum eye comfort and color performance, for any kind of content. Designed to empower creativity, the ZenBook 14 doesn’t sacrifice performance for size. It’s built to give all the raw power needed for effortless on-the-go computing. Featuring the latest 8th-Gen Intel Core i7-8565U processor, 16 GB RAM and a 512 GB PCIe SSD, the ZenBook 14 will never keep users waiting. As for connectivity, the ZenBook 14 is equipped with gigabit-class Wi-Fi and ASUS Wi-Fi Master technology. So, users can enjoy ultrafast downloads and smooth streaming with greater range and more stable network connections than ever before. Additionally, the latest Bluetooth 5.0 brings all the benefits of the latest low-power peripherals and accessories. The ZenBook 14 is powered by a high-capacity battery that won’t let users down with up to 13 hours of battery life. It features an USB-C port for any-way-up connections and superfast USB 3.1 Gen 2 data transfers. And users will also find a USB 3.0 Type-A port, a USB 2.0 port, an HDMI port and a microSD card reader, so it’s easy to connect to all peripherals. In conclusion, the Asus ZenBook 14 UX433FA is smaller, lighter, and has a great design compared to its predecessors. There aren’t many ultraportable laptops with an i7 processor. Thus, it is very suitable for users who need a lightweight device to work on the go. 81.05%: This rating should be considered to be average. This is because the proportion of notebooks which have a higher rating is approximately equal to the proportion which have a lower rating.